EQuala, the first social radio station that enables you to create a personalized music stream based on songs listened to by friends and others with close music interests, has launched in the U.S. With over 23 million tunes in its catalogue, and growing weekly, EQuala is available on iOS and Android devices as a free app. By requiring users to log into Facebook, EQuala develops comprehensive profiles based on music previously shared through Spotify, Youtube, Songza, and other digital platforms, and then helps to facilitate connections and discussions dedicated to music. 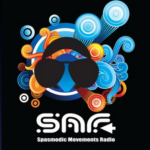 Users can listen to their friends’ songs and share music through this unique social radio platform. At the heart of EQuala is the “Friends’ EQualizer,” a technology that allows users to control their music stream and manage whose music plays more frequently. The automatic flow of music provided from one friend to another bridges the gap between discovering and downloading music recommendations. 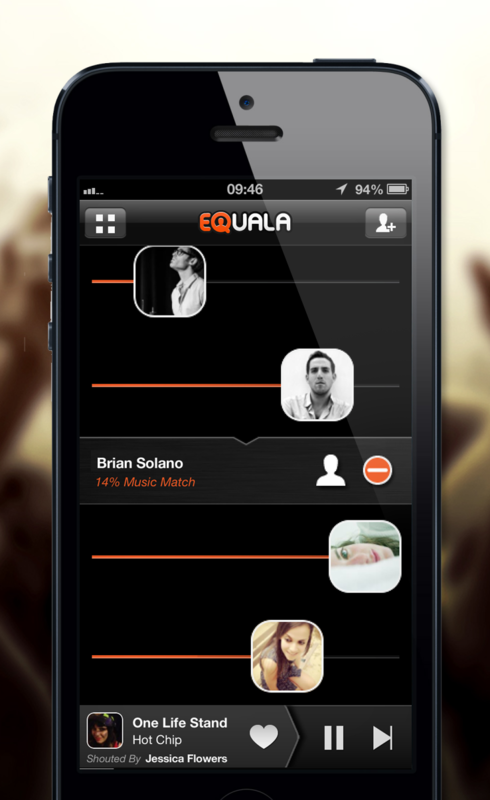 EQuala enables users to communicate through “love,” “shout,” and “re-shout” buttons. These buttons send push notifications to alert you through your phone and allow you to share, through social media, what EQuala users are currently listening to and enjoying. Unique EQuala technology provides each user with their “Music DNA,” which is an analysis of genres and types of music being listened to. Through creating a personalized DNA, EQuala accurately matches users with those in their network who share similar taste. By showing a “% match” between one user and another, EQuala understands its community and connects people. With EQuala, you can enjoy your friends’ music even if they’re not using the platform. 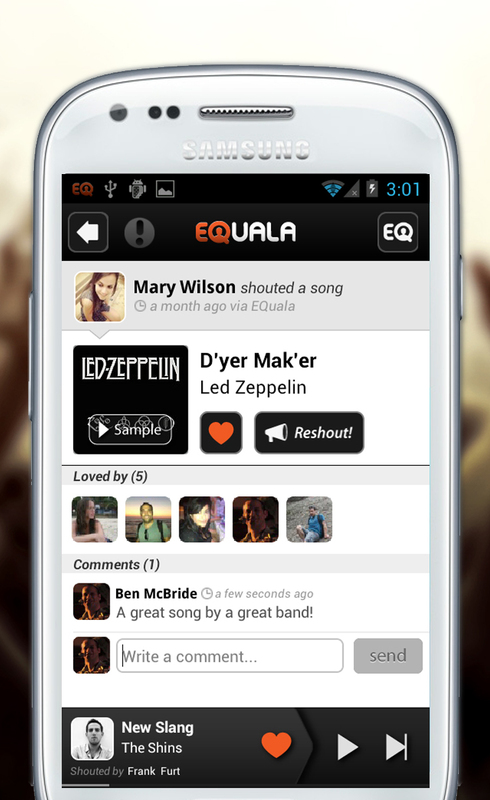 As long as music is being shared, EQuala provides users with the opportunity to develop a tailored social radio. The EQuala experience provides music lovers with a mobile platform to seamlessly discover and incorporate friends’ music taste into their own. Based in New York, EQuala is the first social radio station that enables you to create a personalized music stream based on songs listened to by friends and others who share close music interests. Launched with over 23 million tunes in its catalogue, and growing weekly, Equala is available on iOS and Android devices as a free app. EQuala develops comprehensive profiles for users based on music previously listened to and shared on Spotify, Youtube, Songza, and other digital platforms, then helps facilitate connections and discussions dedicated to music. Users can listen to their friends’ songs and share music through this unique social radio platform.